1,425 million bushels, 59 million below 1948-49.
slightly less than in 1948-49. FOR RELEASE SEPT. 3,P. M.
1,132 million bushels, is the fourth largest of record. compared with the 1939-48 average of 15.6 bushels. least 73 million acres below the 1949 record of 83.2 -nuilion. will be necessary in many areas to effect this reduction. to grasses, sfIfting to other crops, and increasing summer fallow. For the past 7 years rye acreage and production have been small. in 1950 some increase in rye acreage is expected. ment August 1 through August 25 totaled 6.2 million bushels. average of 458 million bushels. in this Hemisphere above prewar levels. same as a year earlier. 5 percent below the 1948 total, and. i3 percent below the. 1935-39 average. which:compares with 13.0 last year and the 1935-39 avorahge of -13.1 million. goal for 1949 of 71.9 million acres by 16 percent. .because of the war emergency. allotment to between 71 million and 72 million bushels. 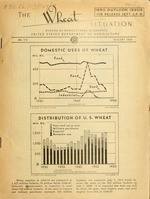 in The Wheat Situation of July 1949, page 8.
not be entitled to price support. at which the proclamation of wheat marketing quotas is required. a minimum of $1.65 to a maximum of $1.77 per bushel 2/. to provide for such minimum farm allotments. suspended because of the war emergency before a referendum was held. spread adoption of higher yielding varieties:' Average for 1938-47 was 15.1.
will continue to be very important in determining the quantity of U. S.
for the rebuilding of stocks in some areas. have been very large in relation to exports from Argentina and Australia. North Dakota and Montana south through Texas and New Mexico (table 1). national acreage and 30 percent of the total production in all other areas. to a minimum support percentage of 70 percent. selected. aver ?-es end ers "
I/' N. Dak., S. Dak., Nebr., Okla., Texas, Mont., 'vwo., Colo., Kans., N. Max. 7/ Idaho, Wash., and Ore,. 5/ Ohio, Ind., Vich., Wisc., Finn., Iowa, Ill., and Mo. 4/ Va., .'. Va., N:.' C., S. C., Ga., Kv., Tenn., Al., "iss., and Ark. and Lake States, the Northeastern and Southern States, and California. cover crop, or for home use largely as feed. and Texas, and over 150 percent in Colorado. acreages of wheat involved are relatively small. to other crops, and increasing summer fallow. effectively utilize grass for forage. this is the case a shift from wheat to such crops would be relatively easy. will facilitate a shift from wheatto livestock production. only a temporary and partial solution to a surplus wheat situation. .the depletion of soil fertility. more. difficult because operators' financial reserves will have been reduced. THE CURRENT DOMESTIC WHEAT SITUATION ..
(figure on page 1, table on page 17). in the 30's and the war curtailed shipping in the early 40's. net exports averaged 169 million bushels. tries, and the continued rise in the general price level. not be much different from the 293 million on July 1, 1949. Expect ed to Continue Steady and Then Advance. principal exporting countries were a record of. 1,737 million . bushels, almost four times the 1935-39 average of 458 million. and by July '1946 they were further reduced to 387 million. to 536 million bushels (table 8). 10 million bushels, with the total decreasing 102 million. December when the new crop year begins in those countries. of Foreign Agricultural Relations, U.S.D.A. creased considerably and to be well above prewar average. about 10 percent less than the good 1948 harvest, but far above average. reported. The United States rye crop is one of the smallest recorded. serious lags in combine harvesting were reported from a number of regions. slightly larger than in 1948.
of this area reporting rye. tries of the area are minor. Rye is of no significance in Africa. countries have agreed to supply 456 million bushels of wheat . have. formally accepted the 7- (m,'-nt and which h ore active participants. signed the agreement, until they have ratified -nd accepted the agreement . Nicaragua, Panama, and the Philippin-.s. East Coast 4$1.97 f.o.b. vessel to all destinations..
Gulf Coast $1.91-1/2 f.o.b. vessel to European Atlantic Ports. East, South and West Africa. West Coast $1.80 in store to all destinations. mendations of th; Exccutive Committee of the International Wheat Council. countries now actively participating in the Agreement. : 13,521) 1,/-35 1,49 7 10.6 143,05"
S..' .njeat Situation, MarchA.pril 1943, pagesi 10 'rod 11.
figures from the National Military Establishments. 1/ Includes CCC stocks stored in steel and wood bins 1942-45.
in 1940-41 was 170,000 bushels.
' Supply data preliminary, distribution data estimated. f/ Includes flour and other products in terms of wheat. duced outside the flour-million industry, plus dutiable imports of flour. / Quantity of wheat ground into granular flour for alcohol production. li.able than exports reported under Army Civilian Supply Program. the ArL Civilian Supply Program. 10/ Shiprents are to Alaska, Hawaii, Puerto Rico, and Virgin Islands; partly estimated. For the war years, U.S.D.A. shiptmnts for stockpiling in the territories have been added to reported Census totals. _1/ Total disappearance plus year-end carry-over account for total supply. less than at the beginning..
Supply Program are from the National Military Establishments. j/ Includes flour expressed in wheat equivalent. Classified as "unfit for human consumption" or imported for special feeding programs. / Usually all from imported wheat, although in some years small quantities of United States wheat were added. -14,076,000* plus 822,000 unreported exports to British Services. 131,298,000* plus 11,358,000 unreported January-June 1947 exports to Germany financed by the United Kingdom. 154,391,000* plus 10,595,000 unreported January-June 1947 exports to Germany financed by the United Kingdom. 2/ 304,688,000* minus the included Army Civilian Supply Program of 97,328,000. S174,559,000* minu the included Army Civilian Supply Program of 41,461,000. Dol. Dol. Dol. Dol. Dol. Dol. Dol. Dol. Dol. Dol. Dol. Dol. V Average of daily cash quotations. 2/ Includes Canadian wheat in'the United States. reached a peak of over 100 million bushels in 1922. (table 10), This is largely because of competition from other crops. duction in wheat acreage in 1950 some increase in rye acreage is expected. Domestic supplies of rye in 1948-49 totaled 29.7 million bushels. 1945-46, exports in 1948-49 were the largest in 20 years. seed, 4.5; and alcohol and spirits, 6.7.
supplies of rye were 54*4 million bushels. were over 5 times as large as a year ago and totaled 3 million bushels. This compares with the record of 23 million bushels in store July 1.
with 12.6 in 1948 and the 10-year (1938-47) average of 12.1 bushels. peak in 1949 market movement. statistical reports of U. S. Foreign Service Offices, or other information. Stocks in Australia are negligible. 1/ Includes United States rye in Canada. 2/ Includes Canadian rye in the United States. From rep6dts -ofDepartment -f-Commerce-. Includes flour. .
SDecember 1 nrice, 1900-1908. Beginning 1940 includes unredeemed loans at'average loan valge. 2/ Estimates based on trade information related to the Census of 1939. / Less than 50,000 bushels. beginning: 15 :15 : 15 : 15 : 1i : : :1 15 15 :15 15 ser. 1940 : 38.3 36.8 38.3 40.5 42.8 41.3 43.6 41.2 43.1 46.5 48.1 47.1 39.9"
at Minneapolis 1933-38, March-April 1945, page MI; 1915-32, June 1937, page 16.
unredeemed loans at average loan values. 3/ Monthly average of daily prices weighted by oarlot sales. Compiled from Minneapolis Daily Market ;Becord.